As a Neutral Milk Hotel fan myself, I've accepted the fact that Jeff Mangum will not be reuniting the band for a comeback tour. In fact, I would hope he wouldn't, because that would simply be a bit too Bon Jovi for my taste. (Sorry Jon, you seem like a really nice guy, but I expected a few more rock & roll moves on your recent appearance on Ellen). But I digress. Shawn Fogel of Golden Bloom had this little idea to recreate Neutral Milk Hotel on ukulele just once for a show in Boston. Neutral Milk Hotel fans had another idea however and Neutral Uke Hotel was born. "...Shawn Fogel is out there, moving around, turning the staggeringly emotional and moving songs that Mangum wrote lo those many years ago into magnificent homages to the originals. Only, the Golden Bloom frontman treats them with his ukulele - though he strays from giving them a cheeky, wine-tasting party blush of romanticism that fellow uke-wielding crooner Dent May might. They are pretty, close to the vest renditions and yet, they feel less like strict covers and more like tributes with a capital T. This rolling company of buddies in the bands Golden Bloom, the Motion Sick and Fogel's quirky Neutral Uke project share an immediately catchable thread of needing closeness, of looking for those special comers whom they can spend "30 Lives" with or whom they could call on to help see through the gunk to the bright stars, up there somewhere." 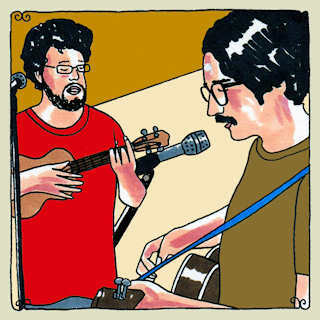 Head on over to Daytrotter to hear Neutral Uke Hotel, Golden Bloom and The Motion Sick songs from the session.